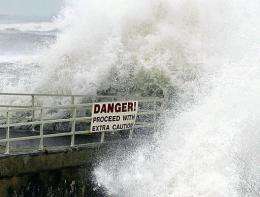 Waves slam over a seawall in Jupiter, Florida, during a hurricane in 2004. The 2010 Atlantic hurricane season may be one of the worst on record, US officials warned Thursday, amid fears it could deepen an oil crisis in the Gulf of Mexico and bring new misery to Haiti. The 2010 Atlantic hurricane season may be one of the worst on record, US officials warned Thursday, amid fears it could deepen an oil crisis in the Gulf of Mexico and bring new misery to Haiti. The National Oceanic and Atmospheric Agency (NOAA) said it was predicting 14 to 23 named storms, including eight to 14 hurricanes, three to seven of which were likely to be "major" storms, with winds of at least 111 mph. Hurricane fears are particularly acute this year in the Gulf of Mexico, where millions of gallons of oil from a leaking BP undersea well is pushing into ecologically sensitive marshlands. And in Haiti, hundreds of thousands of people are still living in makeshift camps more than five months after a devastating earthquake. NOAA said the prospect that there will be more and bigger storms this year than average was due to several factors. Windshear, which helped suppress hurricane activity in 2009 by tearing up storms before they developed, is expected to be weaker this year as the El Nino effect dissipates in the eastern Pacific. El Nino is a cyclical phenomenon that brings unusually warm ocean temperatures to the equatorial Pacific, but cooler temperatures to the Caribbean and the Atlantic. Its opposite is La Nina, when Pacific temperatures are unusually cold. In those years, the US southeast is unusually warm, enabling storms to grow and move. Sea surface temperatures in the Atlantic are already up to four degrees Fahrenheit above average, NOAA said. "Whether or not we approach the high end of the predicted ranges depends partly on whether or not La Nina develops this summer," said Gerry Bell, a hurricane forecaster at NOAA's Climate Prediction Center. And NOAA said the period since 1995 has been one of unusually high storm activity with eight of the last 15 seasons ranking in the top ten for the most named storms. In 2005, there were 28 named storms. about as vague as physorg articles get and they do get vague. but hey they gotta fill the site up with something now that they cant run 50 global warming alarmist pieces a day. It's not hard to predict future events. It's hard to predict future events with any sort of accuracy. It seems I've read this same article several years in a row. I know people like to poo-poo hurricane forecasts but they are not as inaccurate as chance would indicate. There is some skill in it. Things to portend to a bad season: record high sea surface temperatures in the main development region, a Neutral to La Nina wind pattern which does reduce wind shear and certainly does nothing to hurt hurricanes. There is a good weather blog some of you may know by a retired hurricane hunter, Dr. Jeff Masters. http://www.wunder...num=1493 has some more info on this forecast including some graphs relating to the skill of these forecasts.